It is a super oil because it is high in vitamin E. beta carotene and lycopene. Perfect for locking in moisture due to it richness. Is red palm oil the same as palm kernel oil? No it is from the same fruit, but from a different part of the fruit. 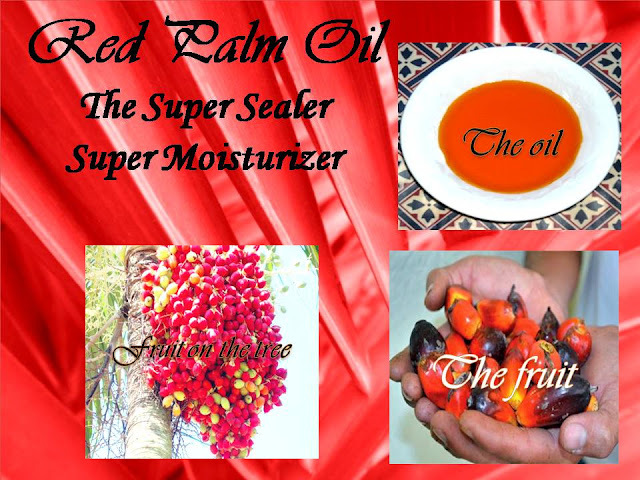 Red palm oil is from the pulp or meat of the palm fruit. It's a red orange color. Palm kernel oil is made from the seed which is left over after you eat the pulp. The seed is mechanically squeezed and it makes a clear oil. Palm kernel oil has less nutritional benefits. It has a longer shelf life and is much cheaper in price than the red palm oil. I am recommending organic red palm oil for the hair. So be mindful of what you pick up in the grocery store. The color of each oil is distinctly different. Use a little bit to lock in moisture as you finish off your shampoo regimen. CHECK OUT MY PART ONE ON THIS SUPER FRUIT OIL FOR MORE BENEFITS.